Your guide to all exotic leathers from around the world. We were going through this small shops and stalls selling souveniers and we found this coin purse that looks ready to jump at us. Seriously, it is a frog coin purse. So we did some research and put together stuff for you to read. 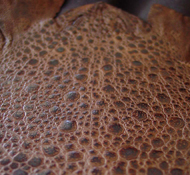 Bullfrog leather when finished has the characteristic "bumpy patterns" on the back (where the leather comes from) with smaller bumps spread between the large bumps and on the sides. It has a very attractive exotic value, and can be very flashy when done in shoes. 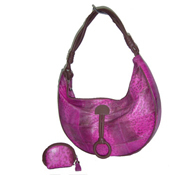 Besides purse, their are bullfrog leather gun holsters, too. 20 centimters long (7.87in), not counting legs and weigh 750 grams (1.65lbs). The bullfrog is native to North America, but has been introduced to a few places including Europe. When approached by a predater will warn with a special call. If that doesn't work can kick, wrestle and push. I'm thinking WWF. Oh, and do you know that the bullfrog can leap up to 2 meters long? Jumps on your feet and bruise it. Seriously, we'd be glad to have information to post for you here. Oh bugs have the largest casualties, followed by birds and turtles but humans, no. Tastes like chicken and only the legs are eaten. Best way to cook them so far is by deep frying, add more seasoning if you don't like the first taste. This frog is found in ponds, lakes, or marshland mainly where the water is quiet and covered with plants. Do you know that bullfrogs use their skin as part of their breathing? Bullfrogs are carnivorous. 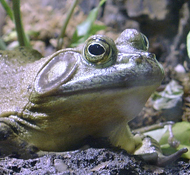 The bullfrog's diet consists of insects, and larger prey such as small mammals, birds, turtles, snakes, and other frogs. As it forms a risk to some ecosystems in Europe, there is an effort to prevent its spread there. There are farms in Southeast Asia that raise bullfrogs for meat and for leather. Did you know, when bullfrog legs are cooked (fried), they looked like chicken drumsticks? In a few locations they are commercially cultured in ponds. The traditional way of harvesting them is to paddle or pole silently by canoe or flatboat in streams or swamps at night; when the frog call is heard, fix a strong light on the frog. The frog will not jump into deeper water as long as movement is slow and steady. When close enough, the frog is speard by a trident and brought into the boat. About 3 years and above (adulthood). 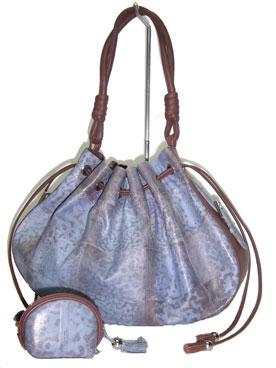 Two portions that make the leather, the back and the belly, the back somewhat more attractive as it has the characteristic small "bumpy pattern". The skin is removed from all connecting tissue and fat and rubbed in salt to prevent decomposition, and then tanned. The tanning process follows that of chicken leather. After tanning, the seller may color and finish it according to the customer requirements. Green, orange? In matte finish? What would you use it for, shoes or purse? Don't you just like choices. Durable like most leather, can be made into uppers for shoes besides wallets and purses. Leather relative value (1-10) in finished products. Copyright © 2004 Stuart Anderson. Contact me.